Platinum Air Filter For Furnaces And Air Conditioners Features A Supercharged Design To Attract Particulates Like Dust To A Tv Screen And Provide Up To 30 Times More Efficiency At Capturing Allergens Than Ordinary Fiberglass Filters. Its Uniform Pleat Shape Delivers A High Level Of Dust Holding Capacity And Maximizes Airflow For Effective Performance For Up To 90 Days. Chemical-Free Construction Eliminates Worry Of Adding Unnecessary Chemicals To Your Air And Does Not Support The Development Of Mold, Mildew, Bacteria Or Other Microorganisms In Normal Use. Air Filter Is Designed To Capture Fine Airborne Allergens Such As Dust, Smoke, Pet Dander, Dust Mites And More.. Platinum Air Filter For Furnaces And Air Conditioners Features A Supercharged Design To Attract Particulates Like Dust To A Tv Screen And Provide Up To 30 Times More Efficiency At Capturing Allergens Than Ordinary Fiberglass Filters. Its Uniform Pleat Shape Delivers A High Level Of Dust Holding Capacity And Maximizes Airflow For Effective Performance For Up To 90 Days. Chemical-Free Construction Eliminates Worry Of Adding Unnecessary Chemicals To Your Air And Does Not Support The Development Of Mold, Mildew, Bacteria Or Other Microorganisms In Normal Use. 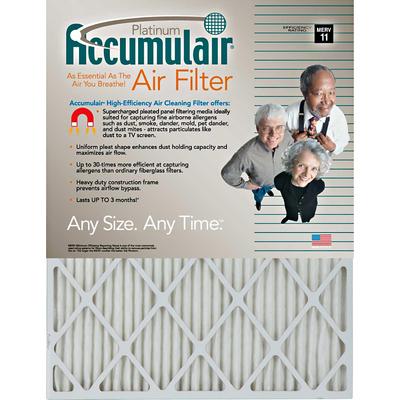 Air Filter Is Designed To Capture Fine Airborne Allergens Such As Dust, Smoke, Pet Dander, Dust Mites And More.